For over ten years, I have declared this Turtle Cheesecake with Chocolate, Caramel and Pecans to be the best cheesecake I have ever tasted. Well, there is a new cake in town. We had some friends over for dinner and I wanted to make something a little different. Fruit was requested over chocolate and I looked around for inspiration. Naturally, I couldn’t leave well enough alone. The brown sugar and almond crust combined with a seriously kicked up lemon flavor to create a dessert that far exceeded my expectations. The lemon changes everything, this is like no other cheesecake I’ve tasted before. 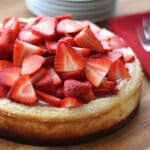 The layers are unexpected and the sweetly tart lemon glaze balanced the barely sweetened sour cream layer and a less than traditionally sweet cheesecake. I absolutely LOVED this dessert. The comments ranged from “ah-ma-zing” to “what are the layers? these are awesome!” to “phenomenal crust” to “the glaze on top absolutely makes this cheesecake.” Hyperbole and excessive enthusiasm aside, this is a FANTASTIC dessert that jumped immediately to the top of my Favorite Sweets List. Preheat the oven to 350 degrees. Combine the almond flour, brown sugar and butter in a small bowl and stir to combine. Press the mixture into the bottom of a 10" springform pan*. Bake for 8 minutes. Cool 30-45 minutes before adding filling. 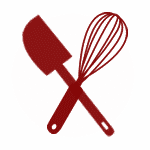 Beat the cream cheese with an electric mixer on high speed until it is completely smooth. Add the eggs, one at a time, beating until smooth after each addition. Slowly add the sugar, beating until smooth and then adding the lemon juice and vanilla. Beat again and then stir in the lemon zest. Pour over the cooled crust and bake for 35 minutes, until set, but not browned. Stir together the sour cream and the sugar and let rest on the counter while the cheesecake is baking. 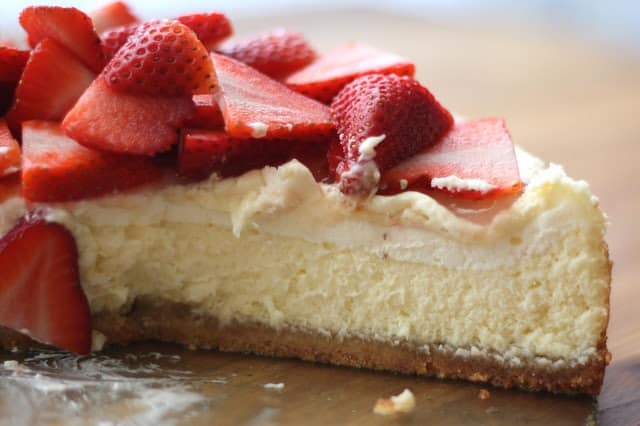 Remove the cheesecake from the oven and gently spread the sour cream mixture over the top. Return to the oven and bake 12 more minutes. Remove from the oven and cool on a wire rack for half an hour. Then transfer to the refrigerator and cool for about an hour, until the topping is cool, but not completely chilled. While the cake is chilling, make the final glaze. Combine the sugar and arrowroot in a small saucepan. Whisk in the water and lemon juice. Bring to a boil, whisking constantly until thickened. Cook 1 minute and then let cool. Pour the cooled glaze over the cool cheesecake and spread to cover completely. Chill overnight. Top with a mountain of berries just before serving, if desired. Enjoy! 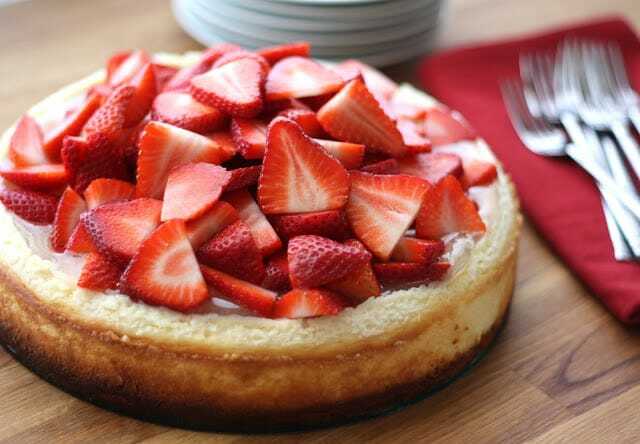 * I've also made this into (5) 3-4" cheesecakes. The baking times are adjusted as follows, the crust baking time is 6-7 minutes. The filling baking time is approximately 25 minutes. The sour cream layer baking time is 12 minutes. This was a huge hit and so good!! My daughter requested your layered lemon cheesecake for her birthday cake. I originally made it for Christmas dinner. I think we have a keeper. thank you! Hello, I was wondering if you think this recipe would work okay to make two days in advance? I need to make it on a Friday to serve Sunday evening. It sounds so good! I think it will be just fine for a couple days. If it hasn't been sliced, it shouldn't dry out at all. I hope you love it as much as we do! Thank you for the quick reply! I will be making it tomorrow so I really appreciate it! This was a very easy dessert to make and sooo delicious. Everyone wants me to send them the recipe! 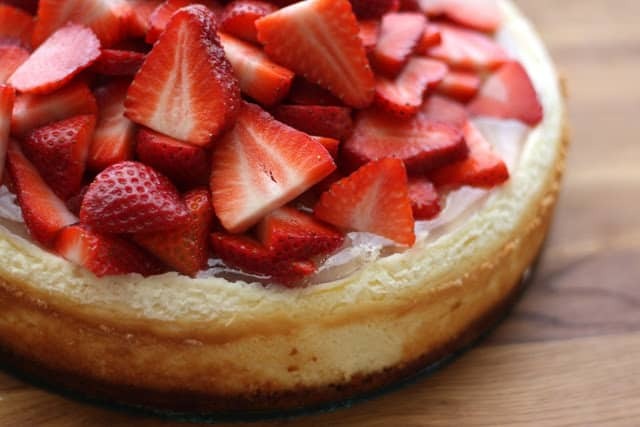 I've made this cheesecake a couple times now - it is amazing! It officially is what I'll be making for my mom on special occasions like her bday. I made this cheesecake for Christmas. 1) Waaayyy too much lemon in the filling and glaze. If I make it again, I will reduce the lemon juice and lemon zest called for by at least HALF. 2) I will also reduce the sugar in the sour cream filling next time. 3)The crust was soggy....and the cake was a little too creamy...so maybe some extra cooking time needed. An important note for those making this recipe for the 1st time at a gathering (like I was), because my oven generally cooks things a little faster than a recipe calls for...I should have cooked the cake longer in this particular recipe. 4) I will probably omit the glaze next time. 5) Next time I will cook the strawberries a little so they don't scatter everywhere & ruin the presentation when I slice and serve the cake. I rarely have time to return to sites after trying a recipe to give it a review, but had to make a special point for this one. Not only was it the best cheesecake Ive ever made, it was also the best tasting cheesecake Ive ever had. And it looked beautiful. I will say, it does require a bit of a process to make it, but well worth it in the end and great for special occasions. I did have to cook my cheesecake filling layer for an extra 4-5 minutes but otherwise a HUGE success. Great lemon flavor (not too subtle or too strong). Thanks for the wonderful recipe! I just discover this recipe today and I must say, IT'S HEAVEN, CELESTIAL!!!. Thank you very, very much! I need to gluten free as well as egg free. Do you think this would work using an egg substitute such as chia / water mix or flax / water mix? Has anyone tried it? Made this wonderful cake for my husband's birthday and it was definitely one of the best ever! I liked it better right away, so smooth and delectable, but hubby liked it more the day after. Amazed that we had any leftovers :) Thanks for the awesome recipe, will be making it again tonight for the wee one and her friends! I'm not really one for getting creative with the recipes, followed this to a tee and everything worked very well. An amazingly good recipe - looks and tastes so delicious. Thank you for sharing! PS. I put the fruit on first then the glaze and it made it look pretty special - all that shiny, glaze fruit! I topped with strawberries and blueberries, then glazed and will definitely do this way from now on. A divine recipe! Thanks again. Leave it in the pan until after it is COMPLETELY cool and chilled in the fridge.